Area : 630 sq. Kms. The Nanda Devi Wildlife Sanctuary is located next to the Nanda Devi Peak at 7816 meters, the second highest peak in India. Spread across 630 sq. 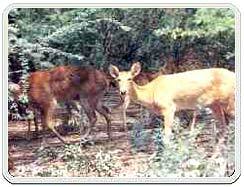 km, the Nanda Devi Wildlife Sanctuary was established in 1980. Until 1934, the gorge of the Rishiganga river and the immediate area around Nanda Devi peak was one of the least known and most inaccessible parts of the Himalayan region. The first men on record to have reached this Sanctuary, while yet in its pristine form, were the British mountaineers Eric Shipton and Bill Tilman. The area had largely remained undisturbed till then, except for Tilman's successful attempt on Nanda Devi in 1936. One of the highest and most inaccessible peaks in India, Nanda Devi soon became a favorite for mountaineers. In the year 1974 the park became an open ground of the mountaineers and trekkers. Forests were pulled down to build bridges and provide fodder for the animals. Slopes of trees were deliberately burnt to provide charcoal for the porters accompanying the mountaineering expeditions. Ultimately, the Sanctuary was declared a world heritage site by the UNESCO. This disallows anyone to enter it. Only in the last few years, some scientific expeditions have ventured into the area to analyze the situation and also to organize clean-up operations. The fauna includes the brown and Himalayan black bears. Himalayan tahr, snow leopards, serow, and chir pheasants are also found. To explore the park you have to traverse on foot, for which special permits are required. Before you start, make sure that you have the permits to stroll inside the park. For any trip to the park, Joshimath serves as an important point. The rich vegetaion and the luxuriant surroundings are exceptional in this area. Traverse through the dense forest cover is restricted to the Rishi Gorge. The main vegetation you will find here is of fir, birch, rhododendron, and juniper. As you go further & further inside the sanctuary, you will come across more & more dry conditions and near the Nanda Devi Glacier the vegetation is almost nil. Starting from Ramani, the vegetation changes to alpine and the place is dominated by the juniper scrubs. The way gradually leads to the area with grasses, prone mosses, and lichens. As you pass through 312 floral species of which around 17 are considered rare you will meet several Fauna & Avi-fauna, just try to catch hold of them in your cam. The entire Uttranchal is overwhelming. The scenic beauty around the sloppy lands will astound you. This is a perfect place to relax and spend some moments in tranquility. Places like Nainital, Valley of Flowers and Garhwal will refresh and revitalize you. 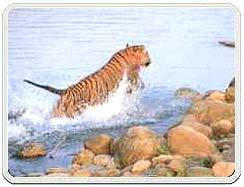 If you are desirous of some adventurous activities then head towards the neighbouring state of Himachal Pradesh. Kullu, Manali, Kangra and Shimla are some exquisite places in Himalchal Pradesh, which will bring the sportsman out of you. You may face problems in expressing your feelings to the local people, as they can not communicate in English. The main language of this region is Garhwali & Hindi. Only the educated people can speak English here. The terrain is rugged and sometimes it is too chilling, especially in winters. Transport facility is limited. Too much snow fall blocks the routes in the winters. Carry some winter clothes with yourself, if you are planning to visit in the winter season. Also carry some hiking and trekking shoes along with yourself. Get friendly to the local people; they would be of great help. Please do not try to disturb the local culture and the local atmosphere. If you want to know more about your destination then feel free to contact us. The Wild Population The unique environment of the park offers a fascinating combination of exotic flora and fauna. The wildlife found in the park includes snow leopard, brown and Himalayan black bears, bharal, Himalayan tahr, serow, monal and chir pheasants. The place is rich in vegetation such as pines, firs, spruces, moru, kharsu, bunras, and there are around 600 species of trees in the region. Air : Nearest airport is Jolly Grant, Dehradun, 315 km (approx). Rail : Rishikesh is the nearest railhead. Road : Nearest roadhead is Lata, 30 km from Joshimath, also connected by bus services. 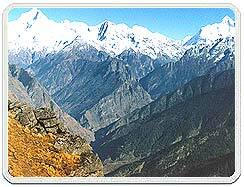 Joshimath is linked by road to Rishikesh and other centres in the region.